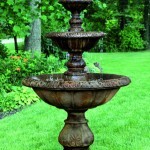 When placing your order for Outdoor garden fountains, please indicate the finish you want for each selection. Basins, pools, and bowls pictured are included in price unless otherwise noted. Pumps included on all fountain orders except where noted otherwise. These indoor and outdoor fountains are available in a wide variety of shapes, sizes and materials. Free shipping. Click on any image for more information.